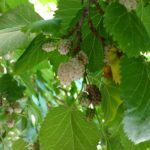 Mulberry trees (Morus spp.) enjoyed popularity in years past as ornamental shade trees as well as for their copious edible fruit, which can be eaten raw or made into luscious preserves, pies and wine. Interested in learning about how to grow mulberry trees? Read out all about growing mulberry fruit trees and mulberry tree care. While people love mulberry fruit, birds also love the berries and the tree is a beacon that attracts dozens of, ahem, messy guests. The tree also has an unwelcome habit of becoming invasive. Unfortunately, this brought the growing of mulberry fruit trees to a screeching halt in any but the most rural areas. Mulberry trees do have redeeming qualities, though, and one of the most outstanding is the minimal care they require. Before we learn about how to care for mulberry trees, here’s a brief synopsis of the three types of mulberry trees most commonly grown. Black mulberry – The most flavorful berries come from the black mulberry (Morus nigra). These trees are native to western Asia and are only adaptable to USDA zone 6 and warmer. Red mulberry – Hardier than black mulberries, red mulberries (Morus rubra) are native to North America where they thrive in deep rich soils found along bottomlands and streams. White mulberry – White mulberries (Morus alba tatarica) were imported from China, introduced into colonial America for silkworm production. White mulberries have since naturalized and hybridized with the native red mulberry. Mulberry trees bear small, unremarkable blooms that become plentiful fruits that look much akin to a slender blackberry. The berries ripen in stages and drop from the tree as they mature. The trees are hardy to USDA zones 4/5 to 8 depending upon the variety. 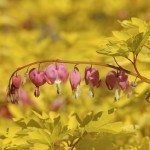 They prefer full sun and rich soil but will tolerate part shade and a variety of soils. They are easy to transplant, salt tolerant and perfect for erosion control, not to mention the delicious berries. Some cultivars are wind-resistant and make wonderful windbreaks. Deciduous trees, all three species attain various sizes. White mulberry can grow to 80 feet, red mulberry around 70 feet and the smaller black mulberry may get to 30 feet in height. Black mulberries can live for hundreds of years, while red mulberry maxes out at 75 years of age. Mulberry trees should be planted in full sun with no less than 15 feet between trees, ideally in warm, well-draining soil such as deep loam. Don’t plant them near a sidewalk unless you don’t mind the staining or the potential tracking in of squashed berries (of course, if this is a problem for you, there is a fruitless mulberry variety too!). Once the tree has established, there is very little additional mulberry tree care required. There really isn’t too much to worry about with this hardy specimen. The trees are fairly drought tolerant but will benefit from some irrigation during the dry season. Mulberries do well without additional fertilization, but a 10-10-10 application, once per year will keep them healthy. Mulberries are even primarily free from most pests and disease. Prune young trees into a tidy form by developing a set of main branches. Prune lateral branches to 6 leaves in July to facilitate the growth of spurs near the main limbs. Do not prune heavily since mulberries are prone to bleeding at the cuts. Avoid cuts of more than 2 inches, which will not heal. If you prune when the tree is in its dormancy, bleeding is less severe. Thereafter, only judicious pruning of mulberry trees is necessary, really only to remove dead or overcrowded branches.